UNITED NATIONS, October 1 -- More than ten African Union peacekeepers were killed over the weekend in two attacks on their base Haskanita, North Darfur. On Monday in New York, the UN Security Council met but could not agree on even a so-called presidential statement condemning the attacks. Inner City Press asked the obvious question -- why? -- to Dumisani Kumalo, the Ambassador of South Africa and to Leslie K. Christian of Ghana, who is the Council president this month. The Ghanaian Ambassador answered that he hopes for agreement tomorrow. When Inner City Press asked what the Council can do to ensure that the African Union force is better equipped, Amb. Christian said that would have to await the deployment of "the hybrid force." Video here. But as another reporter pointed out, that could be some time off. What happens for now? Inner City Press: The President of Senegal has said very explicitly that he would pull his troops if he finds that they were under-equipped and he's ordered his own investigation. Is the UN's understanding that Senegal is going to do its own investigation or is that a part of the African Union investigation? And what does the UN say to a country that says they were under-equipped? Spokesperson: Well, I think you missed again the remarks about the fact that this attack, this kind of attack precisely underscores the need to have a robust force in the future, both the force that is on the ground now -- to reinforce AMIS on the ground -- and as we prepare to deploy UNAMID. Inner City Press: Is that an acknowledgement that they were under-equipped at the time? Spokesperson: I think that you are looking at the same press reports that I have about Senegal. I don't have anything directly from the Peacekeeping Department [DPKO] on that particular country. After he briefed the Council, Inner City Press asked DPKO head Jean-Marie Guehenno if he had heard of Senegal's presidents threat to withdraw his country's troops. No, said Mr. Guehenno, after conferring with an aide. We have not heard from Senegal or any of the troop contributing countries. Maybe you aren't listening hard enough, or even reading the news, one wag remarked. There are reports that the Sudanese government blocked the UN from coming to the assistance of the African Union peacekeepers -- click here for that. 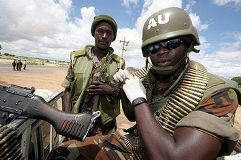 At the Security Council stakeout on Monday, Sudan's Ambassador said his government condemns the attacks. When Inner City Press asked if his government favors the peacekeepers being better equipped, he responded that even with bigger guns, there are still dangers, "like in Iraq," and that the deaths are due to "forces of darkness." Video here. There are reports that assistance offers from Norway have been rejected, presumably by Sudan; there are other reports, including the Sudanese Ambassador himself, that the UN's DPKO has rejected offers of African troops, including from Egypt. So what do these attacks, and the Council's chaotic (non) reaction, portend for the so-called hybrid force? Watch this site.